This view from a camera on the exterior of the International Space Station shows the unmanned Progress 37 cargo ship and Soyuz crew-carrying capsule on July 2, 2010 after another unmanned cargo ship - Progress 38 - failed to dock as planned. This story was updated at 2:11 p.m. ET. An unmanned Russian cargo ship veered out of control nearthe International Space Station on Friday, sailing clear past the orbiting labinstead of docking on autopilot, as engineers on Earth struggle to determinewhat went wrong. The robotic cargoship Progress 38 was slated to dock at the space station at 12:58 p.m. EDT(1658 GMT) but lost its navigational lock on the orbiting lab about 28 minutesbefore the rendezvous.? 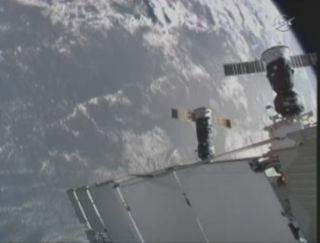 "The Progress literally flew past the station, butat a safe distance from the outpost," NASA commentator Rob Navias said. "The station crew reported seeing the Progress drift beyond their view, asthey worked to reestablish telemetry with the spacecraft." The six people living aboard the spacestation ? three Americans and three Russians ? were never in any danger, NASAofficials said. The Progress 38 spacecraft flew by thespace station at a distance of nearly 2 miles (3 km) away, posing no threatof impact. But because of its orbit, there was no second chance to dock thespacecraft by remote control today. "It's been officially decided that therewill be no docking today," Russian flight controllers radioed the stationcrew. Flight controllers at Russia's MissionControl team in Moscow are working to determine when a second attempt to dock thespacecraft may occur. Because of orbital mechanics, it may be possible to tryanother docking attempt in 48 hours, but that still remains to be determined,Navias said. The aborted docking attempt is the secondmalfunction in a row for Russia's usually reliable Progress cargo ships. On May 1, cosmonauts on the space station hadto take remote control of the Progress 37 cargo ship when it experienced a space navigationsystem glitchduring its own docking attempt. Russia's automated Progress cargo ships havea long track record of delivering supplies to the International Space Station.They rely on a radio beacon system called Kurs that is designed to allow thespacecraft to dock itself at the space station. Cosmonauts on the space station can also takeremote control of incoming Progress spacecraft using a console inside thestation's Russian segment. Space station commander Alexander Skvortsov wasgetting that remote control console ? called the Telerobotically OperatedRendezvous Unit (TORU)? ready when the Progress 38 vehicle veered off course. "I don't think there was any impact toProgress," a Russian flight controller told Skvortsov in a discussion overwhether the TORU system may have inadvertently sent a corrupt command to thecargo ship, aborting the rendezvous. Navias said that once the Progress 38 spacecraft'snavigation system went offline, the cargo ship automatically aborted itsdocking attempt as it is designed to. Known in Russia as Progress M-06M, the newProgress 38 spacecraft is packed with nearly 2.5 tons of fresh food, clothes,equipment and other supplies for the space station's six-person crew. Itlaunched Wednesday from Baikonur Cosmodrome in Kazakhstan. Packed aboard the spacecraft are 1,918 pounds(nearly 870 kg) of propellant for the station, 110 pounds (nearly 50 kg) ofoxygen, 220 pounds (99 kg) of water and 2,667 (1,209 kg) pounds of dry cargo ?which includes spare parts, science equipment and other supplies. Navias said those supplies are not criticalfor the space station's crew. Another Progress spacecraft is due to launchtoward the space station in early September. Russia's disposable Progress spacecraft are similar inappearance to the three-module Soyuz space taxis that ferry crews to andfrom the space station. Both vehicles have a propulsion and orbitalmodule, however Progress vehicles do not have a crew-carrying module like theSoyuz ships. Instead, Progress vehicles are equipped with a propellant moduleto store fuel for the space station's maneuvering thrusters.